FreezePro® Freeze Protection Systems deliver a barrier of uniform, directional heat where it is needed most – to tanks, pipelines, drums, buckets, IBC totes, and other temperature sensitive equipment. ..Shop .Applications. SDS Features & Benefits .Info. .Videos. 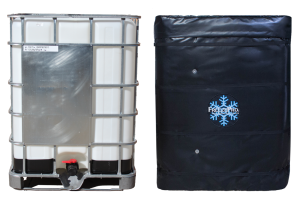 .FAQs..
FreezePro® Frost Protection Systems deliver a barrier of uniform, directional heat where it is needed most – to tanks, pipelines, drums, buckets, IBC totes, and other temperature sensitive equipment. The advanced, all-in-one design of FreezePro® eliminates the need for multiple product purchases and simplifies the entire implementation process while saving time and money. The end result is an efficient, freeze protection, heating solution with the most cost-effective method for minimizing damage caused by harsh or freezing temperatures. Most industrial fluids or substances have rigorous storage and temperature requirements. Cold temperatures can be particularly troublesome especially when maintaining valuable or volatile substances with varied temperature requirements. When these temperature or humidity sensitive articles are transported, stored, or handled in extreme temperature conditions, then damage can occur. This can be avoided by simply installing an insulated heating system/jacket on applications that are susceptible to severe weather conditions. FreezePro® Frost Protection Systems provide superior heating solutions for a multitude of applications that are vulnerable to harsh or cold weather conditions. FreezePro® Frost Protection Systems offer an all-in-one energy efficient, freeze protection, insulation solution to minimize downtime, reduce costs, increase revenues and improve operational efficiencies. Unlike most removable insulation systems, FreezePro® Frost Protection Systems come in standard, universal sizes that are available for off-the-shelf delivery. FreezePro® Frost Protection Systems are designed to fit an array of sizes — and can be used on almost any application that requires freeze or frost protection; temperature or chemical stability; and stress-free bonding or flexible encapsulation. When used as a preventive maintenance product, FreezePro® Frost Protection Systems pay for themselves immediately upon the first freeze of winter. No other prevention type product will pay for itself as quickly and with as little upfront effort, as FreezePro®. Q: Are FreezePro® products difficult to install? A: No, FreezePro® products do not require any extra tools to install and can be up and running in just a few minutes. Q: How are FreezePro® products powered/heated? A: FreezePro® products are powered/heated with a self-regulating heating cables that has a standard operating voltage of 12V, 120V, and 240V. Self-regulating heating cables are available for purchase/replacement at shop.unitherm.com. Q: How do I know what FreezePro® product to order? What is the outside ambient temperature? What temperature setting does your product or application need to stay at? What are the dimensions of the application you wish to insulate? Q: How does FreezePro® prevent my equipment/applications from freezing? A: Applications exposed to cold, harsh conditions expand and contract when temperatures drop below freezing. This can result in a broken pipe or damaged equipment. Installing FreezePro® on your pipes and equipment will help maintain a constant ambient temperature providing freeze protection to vital equipment against harsh weather conditions.